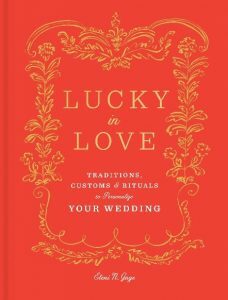 Eleni will be signing copies of her newest book, Lucky in Love, a collection of customs from all over the world meant to bring luck to couples getting married. Drawing on her degree in Folklore & Mythology, and her time as Executive Editor of Martha Stewart Weddings, Lucky in Love: Traditions, Customs, and Rituals to Personalize Your Wedding is also a beautifully illustrated fun gift book for anyone interested in folklore. Virtually every culture, religion, and community has devised rituals around weddings that are meant to imbue the marriage with good fortune. Now these often centuries-old customs can inspire new ways for today’s couples to celebrate their own unique love. In Lucky in Love, Eleni Gage presents both beloved and little-known traditions with whimsy and depth, imparting ancient wisdom with a modern attitude. An essential resource that is also the perfect thoughtful gift, it will inspire engaged couples to create their own lucky traditions with nods to each other’s heritage, customs from places they have visited together, or auspicious rituals that just feel special. A novelist, journalist, and former executive editor for Martha Stewart Weddings, Eleni N. Gage graduated from Harvard University with a degree in folklore and mythology. Error: Error validating access token: Session has expired on Monday, 08-Apr-19 19:39:38 PDT. The current time is Wednesday, 24-Apr-19 08:48:46 PDT.